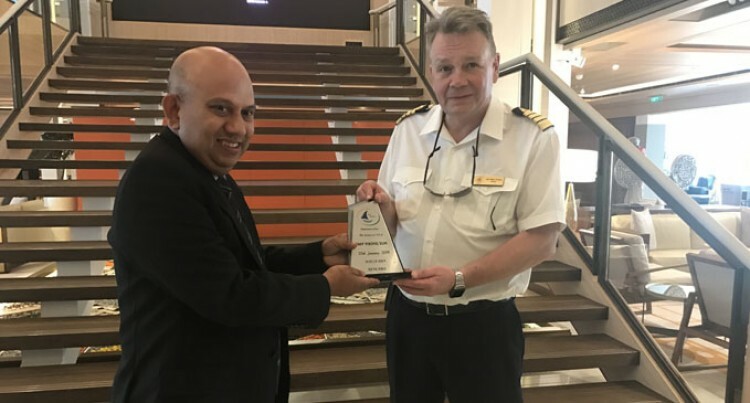 Fiji Ports Corporation Limited chief financial officer Roshan Abeyesundere led a delegation that greeted the Norway cruise liner Viking Sun, on its inaugural cruise to Suva, last Thursday. As part of tradition an exchange of commemorative plaques was done on board with Captain Alte Knute. The 227.2metre long cruise liner is owned by Torstein Horgan, a Norwegian billionaire. The vessel sailed into Suva harbour with 869 passengers and 465 crew members. Accompanying Mr Abeyesundere were representatives from the Biosecurity of Fiji, cruise liner local agent -Kenua Shipping officials and members of the local media. “Fiji is a beautiful place and this is our very first call to this very warm tropical country,” Mr Knute said. “This cruise liner is only three months old. We started in 2015 with our first ship the Viking Star, Viking Sea, Viking Sky and then the Viking Sun and six more ships are coming because we are expanding,” he said. He said Viking Sun was different from other cruise ship as it made passengers feel at home and that they travelled comfortably. “Viking’s itinerary features travel in Northern Europe, the Baltic, the Americas, the Caribbean, the Mediterranean, Asia, Australia and New Zealand. Our ship spends more time in port than what is common with other ocean lines, emphasising a focus on culture of our destinations. “In December 2017, we launched our first around the world cruise, which departed from Miami and sailed south to head through the Panama Canal and planned to visit five continents and 35 countries and 64 countries before ending its 141 day journey in London. More than 120 vessels are expected to call in this year at the Suva and Lautoka ports. “We warmly welcome all the new vessels like the Viking Suns and proudly labelling us as the pride of the Pacific in the port industry and in that broader vision, we are now seeing new and beautiful vessel that are coming and is encouraging that your company is building more new ships,”Mr Abeyesundere said.